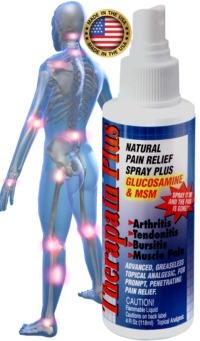 Top Rated Tendonitis Treatment for 14 Years! Click here here to learn more about how Therapain Plus can help with your Tendonitis, as well as other painful conditions! Stretching can help relax and lengthen a tendon, but never stretch the painful and inflamed area, as this can worsen the tendonitis. Instead, stretch the more pliable muscle around the tendon. Tendonitis.net shall have sole discretion for determining the types of advertising and sponsorships that shall be accepted and displayed on this web site. All advertising on Tendonitis.net shall comply with the laws and regulations of the United States of America. Under no circumstances shall Tendonitis.net's acceptance of an advertisement or sponsorship be considered an endorsement of the company or the products which they manufacture. Tendonitis.net retains the right to reject advertising or sponsorship of any kind, and will not accept advertising or sponsorship which, in Tendonitis.net's opinion, makes unsubstantiated claims of therapeutic benefit for a particular product(s). Tendonitis.net does not endorse the content on any third party websites. Tendonitis.net is not responsible for the content of linked third-party sites, sites framed within the Tendonitis.net, or third party advertisements, and does not make any representations regarding their content or accuracy. Your use of third-party websites is at your own risk and subject to the terms and conditions of use for such sites. Tendonitis.net does not endorse any product advertised on the Tendonitis.net. To link your site with ours, email us and let us know what your website contains and where you will place a reciprocal link with to our site. Health-conscious consumers who go online are actively seeking solutions for themselves and their loved ones. Consumers are motivated to find the best information possible and to act on that information. Because we empower viewers to act, more consumers are coming to Tendonitis.net and accessing credible and up-to-date consumer information. Through our innovative, direct-to-consumer sponsorships, you can deliver your message to an consumer, target your message to a specific demographic or maintain a presence on a this topic. We are committed to developing flexible sponsorship packages that not only assist you to meet specific marketing goals, but enable us to strengthen and maintain the integrity of the Tendonitis.net portal. The contents of this site, such as text, graphics, images, information obtained from www.Tendonitis.net licensors and other material ("Content") contained on this site s for informational purposes only. The Content is not intended to be a substitute for professional medical advice, diagnosis or treatment. Always seek the advice of your physician or other qualified health provider with any questions you may have regarding a medical condition. Never disregard professional medical advice or delay in seeking it because of something you have read on this site! Copyright 2003-2015 Tendonitis.net. All Rights Reserved.